IMPORTANT - Restrictions on use 1. NEVER land in the fields immediately adjacent to, or immediately across the road from the farm named 'The Hope' on the site guide map; doing so will jeopardise permission to use the site. 2. Please keep out of the large field that extends up into the heather/fell side east of the 226 spot height (see photo 2 and site guide map). We are currently unable to gain permission to access this field, plus the drystone walls have been repaired such that there is now no access from the top of the field to the open fell. 3. NEVER, EVER CLIMB A DRY STONE WALL. Note that irresponsible pilots doing so in the past have nearly lost us this site! A beautiful site that can provide classic scenic Lakes flying and good XC options. Works best in W to NW winds, but can be flown OK in the more limiting WSW winds. Can sea breeze early, but will continue working although with reduced lift. Offers various XC opportunities from short first steps to full on epic mountain flights for the experienced. Millbeck. This house is half a mile SW of the Swinside parking area. From here you need to drive north 0.2 miles to the next road junction. Turn right here and drive up this road for just under half a mile. The car parking area is just after the gate going north (about 0.2 miles after 'The Hope' Farm). From Keswick take the B5292 off the A66 and head for Whinlatter Pass. About 1 km after the top of the pass turn left onto a narrow single-track road sign-posted 'Hopebeck'. Follow this round into the Lorton Valley and again turn left at the only junction. There is a gate at map ref NY175252 (near the 257 spot height, see photo 3). 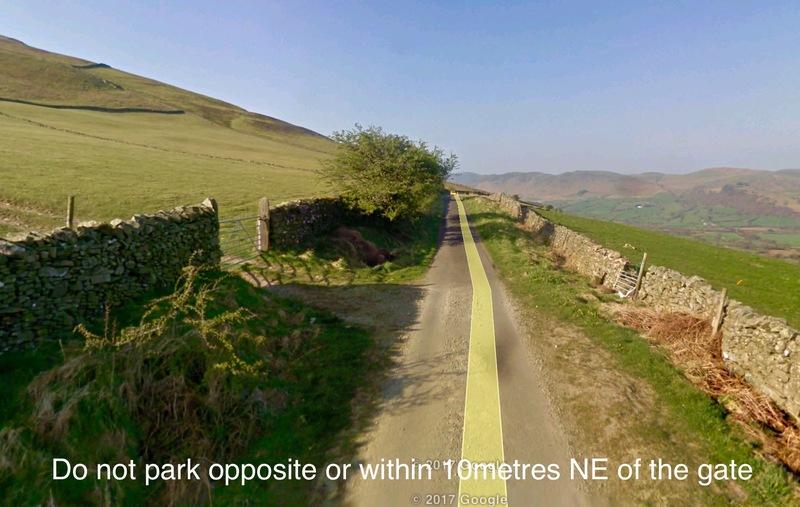 It is possible to park on the wide roadside verge near here, BUT be sure you do not park opposite the gate or in any way that could hamper access for tractors or vehicles with trailers, and be prepared to obediently comply with requests from farmers WITHOUT ARGUMENT! Drive through the first fell gate and descend to the parking area on the left just before the second fell gate (and just before 'The Hope' Farm - grid ref NY 169242). See photo 5. Please keep out of the large field that extends up into the heather/fell side east of the 226 spot height (see photo 2 & site guide map). 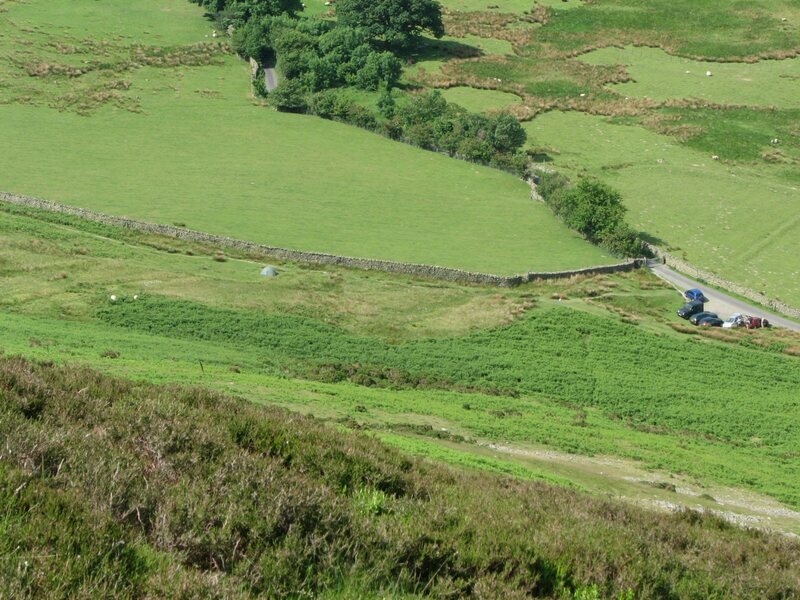 We are currently unable to gain permission to access this field, plus the drystone walls have been repaired such that there is now no access from the top of the field to the open fell. We have gained permission to more easily access the site and to land back in the field south of the 257 spot height. (see site guide map and photos). From the gate (see photo 3) go up the field and through the sheep pen, carry straight on up the path to above the bracken line, then cut right contouring round the hill until you meet the wall. Follow the wall until a corner where it meets the fence...theres a big rusty roll of wire there at the moment. Take care not to damage fence or wall when crossing it (see photo 4). There are take offs around here, either side of the fence, suiting W to NW winds; in light winds, cross the fence and ascend the fell to the big flat take off area higher up. There is access all the way up to the top of the fell from the the old quarry at the foot of the fell (photo 5), pilots may take off and land anywhere on this fellside above the road. Take off is a direct ascent from the car park to above the heather line, so the walk up is hard! The best way (only obvious when you walk down) is to walk along the track SSE from the car park for around 100 metres. Look for 2 runnels going directly up the fell. Take the right hand runnel, after inspecting the landing area, and walk directly up the fell. Towards the top of the runnel look closely for an indistinct track on the left going diagonally up the fell. This will take you steadily up although it peters out near the top. Get above the heather beds to find the grassy take off. Ms C England, The Hope. NY167240. Mr W Shields & Family, Scales Farm. NY166254. Mr J Hope, Cornhow Farm. NY151223. Take care in freshening winds, if you get blown back you will almost certainly be in rotor and there are limited escape options if this happens. Beware turbulence if you are losing height and might drop behind/downwind of Dodd (the small conical hill 1km SW of the site). 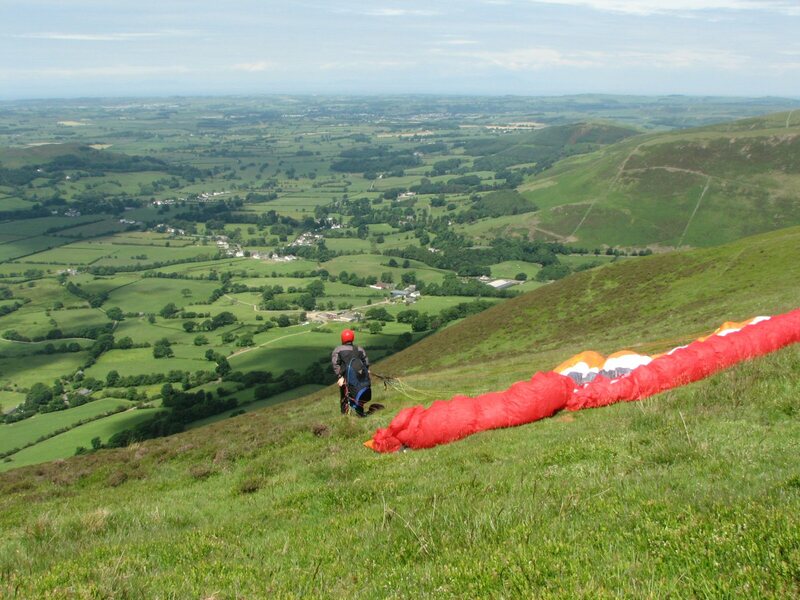 Inexperienced pilots should take care if slope landing on the steep heathery fellside. With increased landing areas this is now a classic site with easy, safe take offs and good landing options. Generally the take off areas are west of the ridge line fence, between the fence and the heather beds. Take offs at the top of the fell are more reassuringly further from the fence than those lower down. - In the field south of the 257 spot height (at the start of Access Route 1) - provided we do not unduly disturb any stock. - At the foot of the fell above the Route 2 parking place. - In any of the fields West and North West of the Hopebeck/Swinside/Whinlatter Road (apart from those fields immediately adjacent to 'The Hope' farm). A beautiful site that can provide classic scenic Lakes flying, but see hazard notes. Works best in W to NW winds, but can be flown OK in the more limiting WSW winds. Can sea breeze early, but will continue working although with reduced lift. Re Hang Gliders: This guide used to say 'Not suitable due to big steep carry up and lack of suitable landing areas'. A hangie pilot has reviewed the new Access Route 1 and the landing field south of the 257 spot height and now considers the site better suited for hangies. Opportunities for XC flying and exploring up and down the Lorton & Buttermere valleys and beyond are superb. 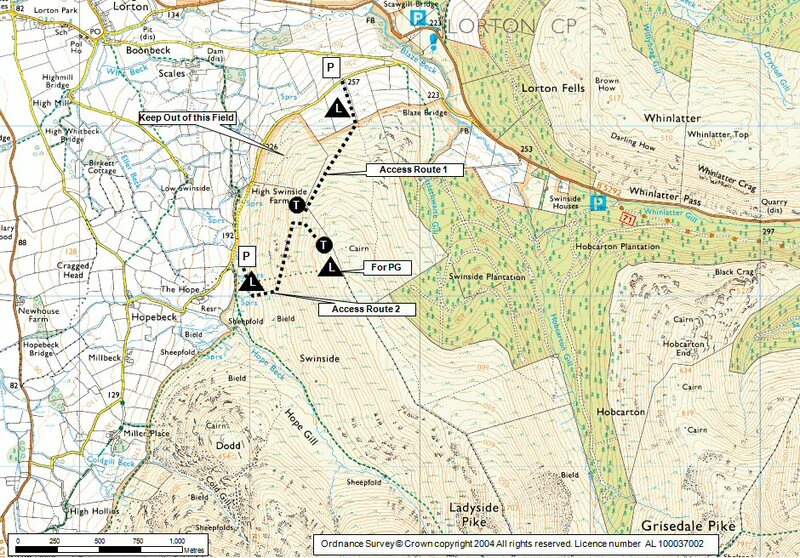 Short out & return XCs north onto Kirk Fell and south to Dodd and Whiteside are good XC starter routes. 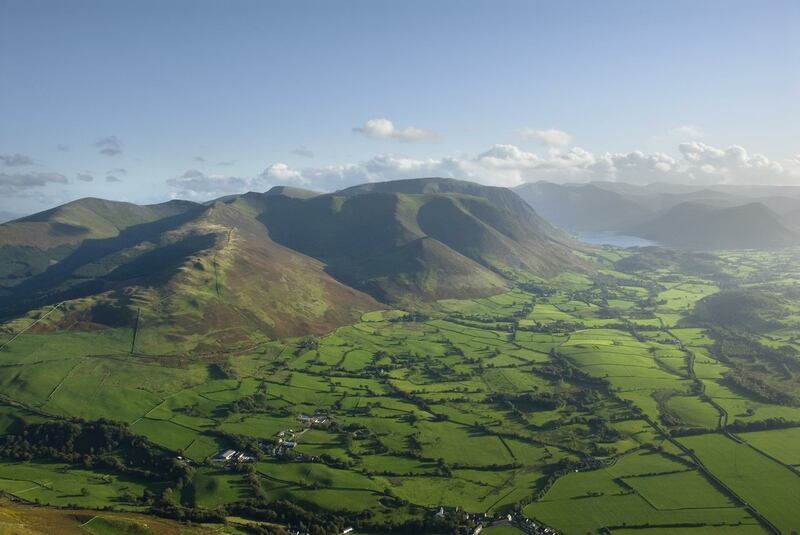 For experienced mountain XC pilots, flights to Keswick by various routes are frequently achieved and it is possible to connect via Borrowdale across Thirmere and then up or down the Helvelyn range, with the rest of the eastern Lake District at your feet! PHOTO 1 An aerial view of the northern end of the Derwent Fells massif looking S. The Swinside ridge is in the centre left with the wall rutnning up it. Take off areas are generally limited to grass area between the wall and the heather line. Photo by permission of Andrew McMahon web site. PHOTO 3 Parking for Access Route 1. Park anywhere suitable on verge, ensure you are off the road and not hampering gate. From the gate, go up the field and through the sheep pen, carry straight on up the path to above the bracken line, then cut right contouring round the hill until you meet the wall. Follow the wall until a corner where it meets the fence...theres a big rusty roll of wire there at the moment. Take care not to damage fence or wall when crossing it. 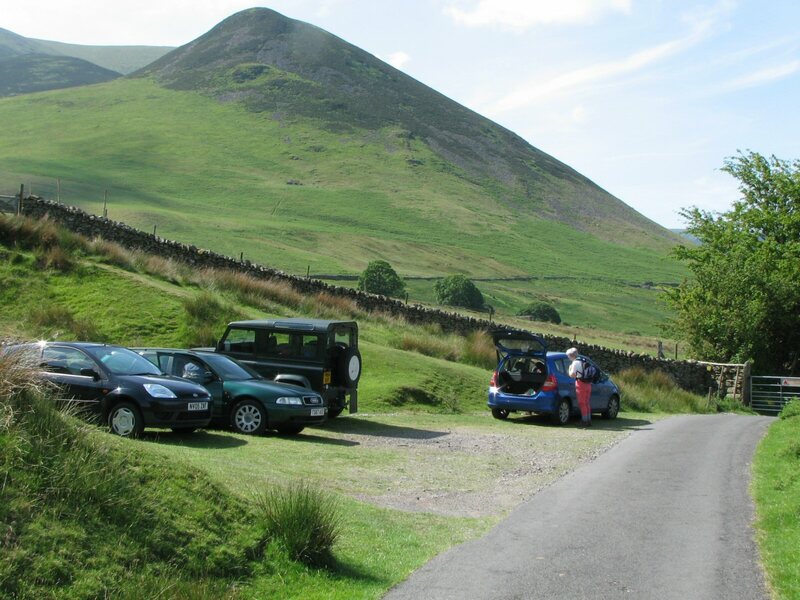 PHOTO 5 Parking for Access Route 2 - at foot of the fell in old quarry by the lower gate. Park tidily as it's a bit cramped and it's used by walkers. PHOTO 6 Looking down to access route 2 landing which is in the region of the tent - mainly to the left. It does slope and can be boggy. PHOTO 7 At take off looking NW. It helps to get above the heather! Notes : Serves food. Opening times variable mid week.